Before becoming a homeschooler I didn't really understand the value of copywork. My first homeschool conference changed as one of the speakers shared how important it is. She told us it is more than just writing or penmanship, it is establishing solid handwriting foundations, helping with memory (both physical and mental) and building motor skills. Adding quality copywork / penmanship by picking subject material with scripture, hymns and other important speeches and you are giving them a bit of character learning without them even knowing. Penmanship is an essential part of learning and being able to form letters properly is a learned skill that takes practice. 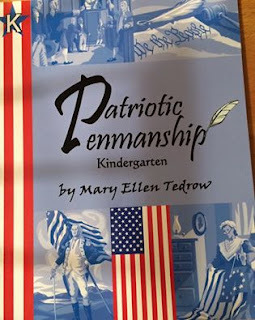 Laurelwood Books recently sent me their Patriotic Penmanship Kindergarten level for review. Patriotic Penmanship is a book series that has levels starting with Kindergarten and going up to High School. They have manuscript and cursive and a few in between grade level books. The book we received - Kindergarten- starts out with copying the basic alphabet then advances to individual letter learning. After that you move onto more individual letters but each page also has additional work that includes 2 letter sounds, CVC words, and longer words. For each work section there is a spot to trace then a space to write on your own. This book included 24 lessons total. There is scripture in the book and a few pages even have drawing spots. The binding is a soft bound and the pages are not perforated so you cannot remove them. (I am considering getting the book spiral bound at the copy shop but so far it hasn't been an issue as it is not thick at 76 pages). Our main curriculum suggest using a copywork book so I was thrilled to receive this book to use along with our curriculum. I liked the bright cover and that is was Christian based. 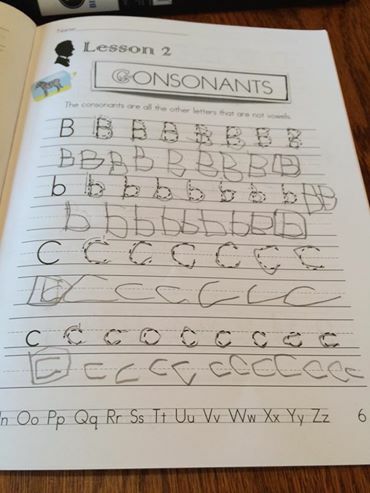 My five year old knows his letters but is still needing lots of practice writing them. So I've been assigning him a line or two a day to go along slowly through the book. He already has a bit of writing during spelling and phonics so I don't want to overwhelm him. At this pace this book should last us most of the school year - and that works perfectly for us. One of the ways we motivate our son is with stickers. Good writing and good work get a sticker when completed. J-man loves getting a sticker and know that he did his best. We've used this policy with this book and as you can see it makes him very happy! This has been a great addition our kindergarten year. I was very worried for awhile about handwriting because it has never come easy to any of my boys. J-man has a desire to write and loves doing it but he really needs lots of practice. We are able to take our time with this book - I don't try to do a whole lesson in one day because they are meaty. If we were not doing other written work it would be easily accomplished but combined it works better to have him doing a few lines for each page a day and progressing through the lesson over the course of the week. So far this has worked well and he has enjoyed using this book. I really like that as we progress more words are introduced at a natural pace this included reinforcement is awesome! This is a really nice copywork book, we have both been pleased with the layout and the lessons. By clicking on the banner below you can check out the what the CREW had to say about the above products! I am enjoying this workbook as well for my 1st grade son who needs alot of handwriting practice.